Justin Bieber sang "Cold Water" for his fiancée Hailey Baldwin outside Buckingham Palace in London. Justin Bieber and Hailey Baldwin are fast becoming a favourite showbiz couple. They often share cute social media updates about each other and are currently keeping everyone waiting with bated breath for a wedding date announcement. On a recent holiday to London, Justin and Hailey hit up all the requisite tourist spots including the London Eye and, of course, Buckingham Palace. 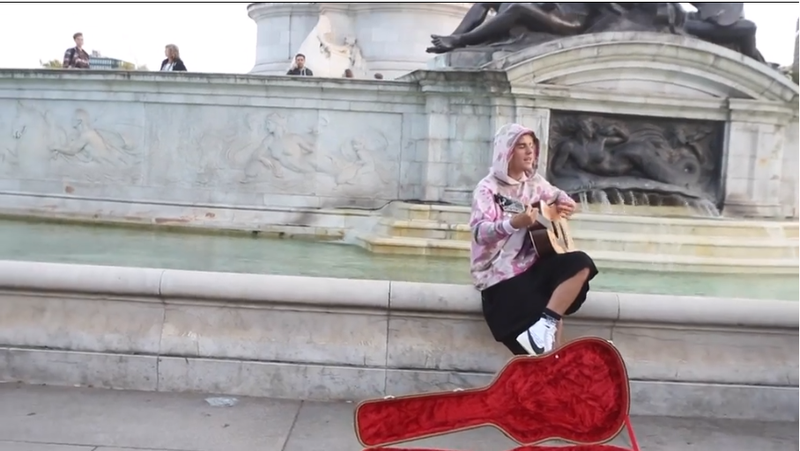 While others would look out for the Changing of the Guard, Justin chose to put on an impromptu performance outside Buckingham Palace, serenading Hailey with an acoustic version of his song "Cold Water". Naturally, a small crowd gathered to watch as the 'Purpose' hitmaker crooned in front of the Queen's famous address. He said, "that girl right there is the love of my life", and pointed to Hailey who blushed. She was later seen recording her beau's performance, likely so that she could relive the romantic moment later. Hailey recently put paid to rumours sparked by the couple's attendance at a Manhattan courthouse last week, saying: "I understand where the speculation is coming from, but I’m not married yet!" Perhaps they were only in London looking at potential wedding venues...? While the crowd certainly enjoyed Justin's performance, there is no word on whether he earned any money from his quick stint as a London busker. What would you give to have a famous pop star serenade you?